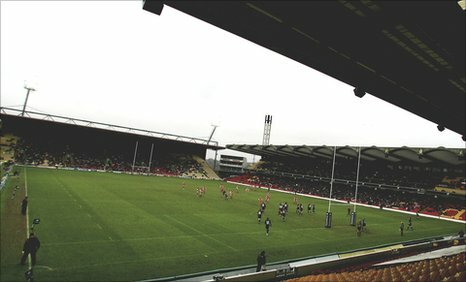 Watford have said they are expecting Saracens to leave Vicarage Road at the end of this season, with the rugby club looking at other possible home venues. The current arrangement, which has been in place since 1997, ends next summer. Non-executive director Stuart Timperley told BBC Three Counties Radio: "They have pursued their options and we were one of them. "Our view was we are one of the least likely options and that they are seriously pursuing another venue." He added: "From recent publicity and from what our understanding is they are seriously pursuing another option, so the notice position holds." Saracens chief executive Edward Griffiths recently ruled out a move to either Wembley or the Olympic Stadium. More recently they have been linked with a move to Barnet Copthall Stadium in north London. Watford's head of business operations Michael Jones has not totally ruled out Saracens staying at Vicarage Road. "It's safe to say they are looking at other options ahead of Vicarage Road, but we are still one of their options," he said. "We've made our position clear to them, and while we'll never say never, we have to plan for the future as if they're not going to be here, as that's how it feels to us. "There is a number of things we have to put in place to make sure we're ready for the future without them."